There is still work to do to finish cleaning up the gap. Also, the mismatch colors are due to my shortage or white LEGO. I would have preferred the top section to sit a little deeper into the first section but this was the best I could do and I think it is very close to the line art I have of the SDF-1. 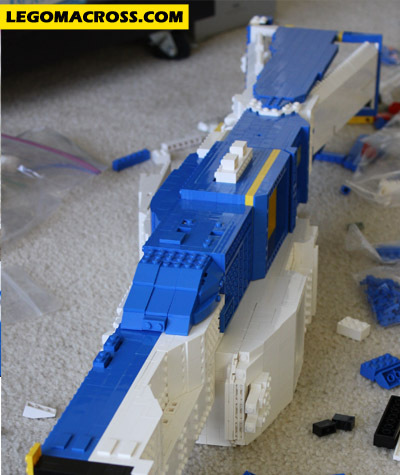 I’m not going to do too much more with the second half of the middle section until I receive more white pieces. This was fun to build (so far) and it turned out better than I expected. This project is a beast! I’m running out of so many types of LEGOs, I totally underestimated how many pieces this project would require. Today I submitted two more Bricklink orders for pieces, on top of the three orders I already have outstanding. I am afraid to tally how much this ship has cost; I’ll wait to add it up when I’m done. Today I worked on the second half on the white center section, the section of the ship that the bridge sits on. 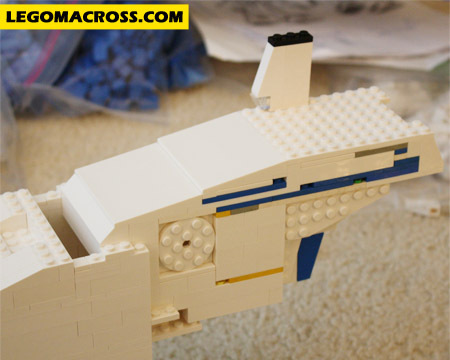 The tricky part about this section is that rotates clockwise into the first half of the white center section when the ship transforms. In order for me replicate that important feature I have to find the best point of rotation. 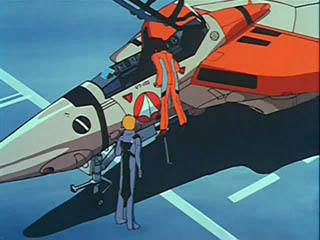 Again, I am working only with pictures I found online of the SDF-1, I don’t have a toy or model to assist me. I’m building the rotation points with simple Technic pin 1×2 bricks. Below is a photo of the section after I determined the best points for rotation. It took a long time to find the best points! It was not easy, a lot of trial and error! Next I had to determine how long the section should be; again I used the images available to me. I used these images to determine how long the section should be (how far over the legs did it extend). Below is a picture of my first attempt to build this section out after I pinpointed the points of rotation. You’ll notice I’m using other color LEGO in this section besides white; that is because I ran out of many of the required white bricks and plates and was forced to use my old spare bricks as substitutes. After I built this section and took this picture I decided it was too bulky/blocky and took it apart. Again, just like the leg the slopes and angles were the source of the problem, replicating them is no easy task. With the first attempt I felt the slopes I created were not faithful to the images I had of the SDF-1 and I knew I could do better. I did the best I could to be faithful to the SDF-1 images. I used wedge plates to create the outer angles and inverted slopes for the inner ones. I was also able to match it closely to the images I have of the SDF-1. I’m happy with how this section has turned out (so far), but there is still a lot of work to do here: I’m still missing many of the pieces that I need and I still need to finish the bottom/back of this section. Also, this section is mostly hollow and I am planning something special for the inside! Being short of so many critical pieces I am not sure what I’ll be able to work on tomorrow. I’ll sleep on it. Although I made a lot of progress, it is a slow build. So far I have spent two days on this one leg. I have rebuilt section after section after section over and over again, it is very tedious. 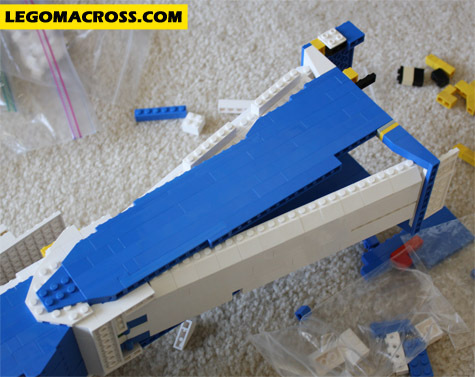 Even when I ‘finish‘ this leg I’ll still have to rebuild parts of it depending on what I select to store inside of it (perhaps a version of Macross City). Also because I’m short on so many pieces I have to use my bucket of old spare pieces to fill in the gaps. If it wasn’t for those parts I don’t know where I would be at in this build. Starting to build the bottom of the leg, about 4 hours into the build. Progress to date, quite a bit more work to do but at least it is starting to look more like the SDF-1. Just this one leg has decimated many types of my inventory of plates and bricks; I’ll need to order hundreds of more pieces to finish this ship. 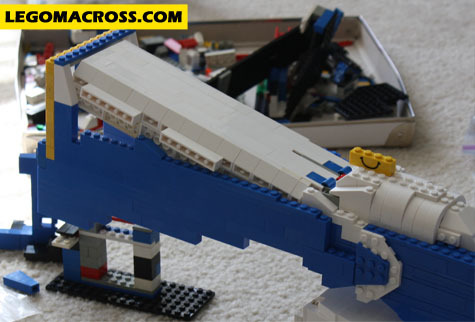 So yet again back to Bricklink I go to search for blue, white, yellow and black LEGOs. Because of the shortage I won’t be able to do too much tomorrow to progress this leg. Maybe I’ll spend time working on the second part of the white center section, hopefully I’ll have enough white pieces for that. Added the angled top section to the white center section. I wish to build the outer blue section to be 1 stud across. 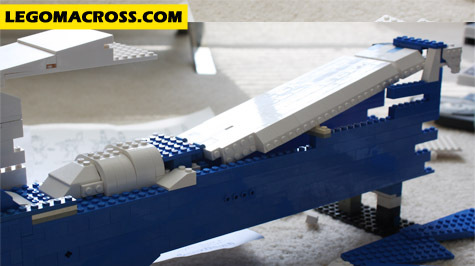 The longest LEGO blue brick slope that is one stud across is 4 studs long. 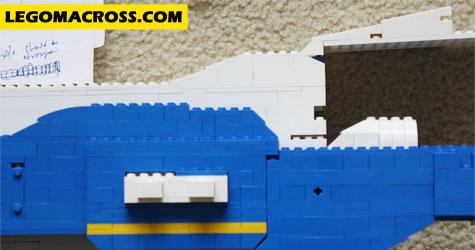 I can find longer curved blue brick pieces that are 1 stud across but these leg angles call for sloped pieces, not curved pieces. 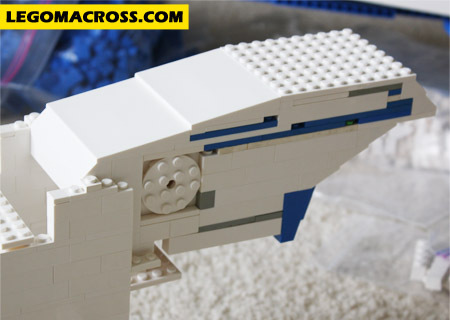 Then I thought about using wedge plates for this section but again LEGO does not produce the longer wedge plates in blue, so no luck there. Just to satisfy my curiosity I even tested the theoretical building technique with white wedge plates to see if it would work and the answer was no anyways, the angles of the wedge plates did not work. 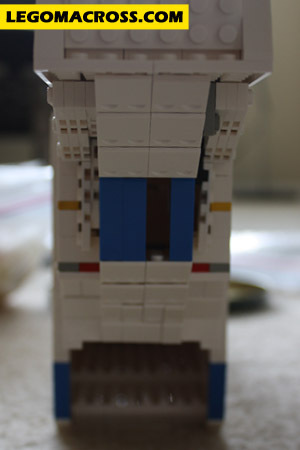 The center white section of the SDF-1 legs is just as difficult, same angle problems. 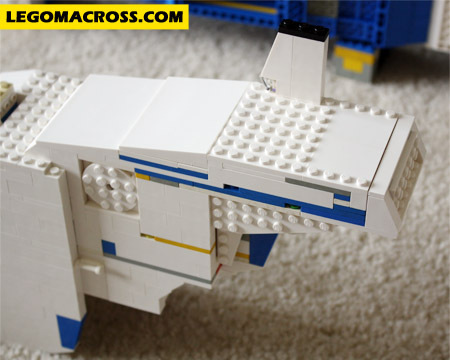 In the past when I have built LEGO SDF-1s I have used plates and hinged plates to create the angled white center section: I would attach a white plate to white hinged plates at the bottom and at the top of the leg. The method works ‘ok’ but it is always difficult to line up the hinges and plates – it never fits exactly. It also makes any storage within the leg difficult to access because the hinge and plate assembly are not easy to seperate. Below is a pic of my first attempt at the building the leg with the hinge and plate method. Trying the build the white center section with hinged plates. The hinged plate is at the bottom of the leg with all of the white slopes. After considerable frustration with the angles already, I did not want to settle for the status quo of the plates and hinges for the white section of the legs. After all of the time, effort and money spent of this model I felt such a poor and recycled technique was not acceptable. However, what else could I use? Wedged plates would work because the angles were too severe. Early in the day I tried a crazy wedge plate, modified headlight and plate combination – that didn’t work. 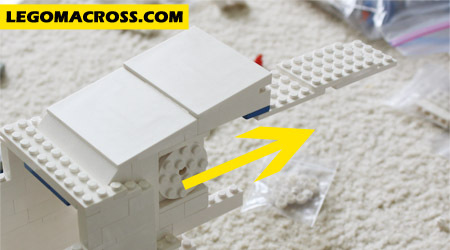 Angled slopes would work because although LEGO makes longer sloped bricks in white they do not make them one stud across. I was running out of ideas. 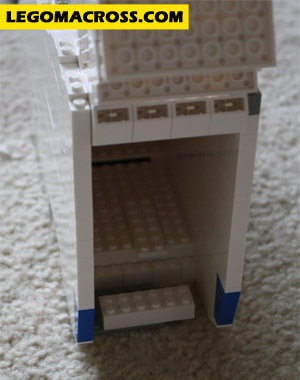 My current solution is to use hinged bricks, it looks OK to me now, but it presents additional problems such as weight. Also, with the hinge I’m only able to attach the white section to the top of the legs. To be truthful, the hinged bricks isn’t that much different from the hinged plates – so maybe that is still the optimal solution. 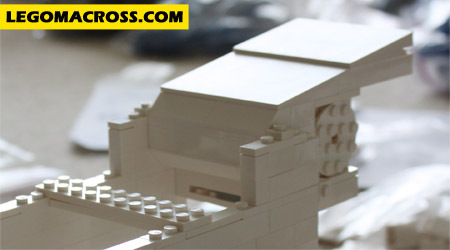 Building the white center section with hinged bricks. Also notice the studs on the side and the wedge plates of the carpet, those were from testing the wedge plate building technique for the side. I have spent all day of this leg, and I still have a long, long way to go, but at least it is started. I hope I can turn this into something respectable, I don’t want the legs to ruin the build and my goal to create a faithful LEGO SDF-1! What a disorderly arrangement! 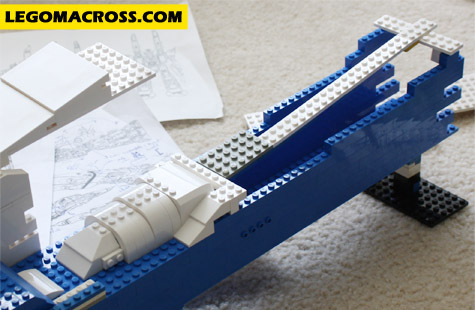 This guy is completely ignorant of LEGO building tactics! 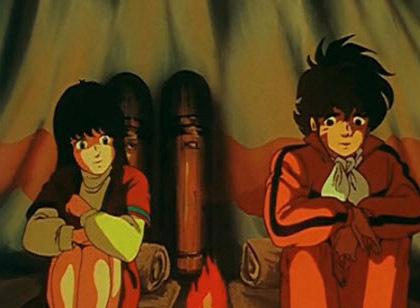 External view from the legs into Macross City from Macross: Do You Remember Love? 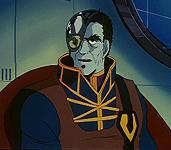 But in the Macross series I have not found any references to the exact location of Macross City within the SDF-1. 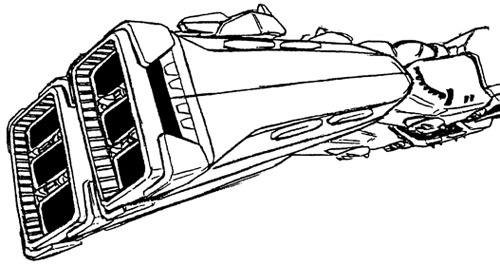 I always used to think the city was in the white center section of the ship until I viewed DYRL and observed that it was actually contained in the leg of the ship. 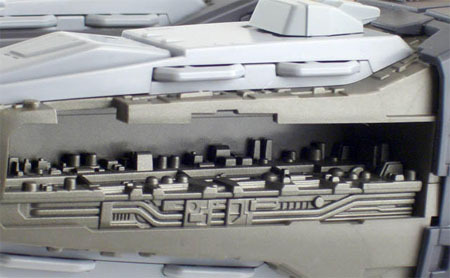 Macross City within the leg. I have scoured the internet for a ‘Macross City Map’, ‘Macross City Location’, etc. and mostly what I get are images and information about the DYRL version, not the series version. As I mentioned when I started this project, there is much more information and pictures available for the DYRL version, it is by far more popular. 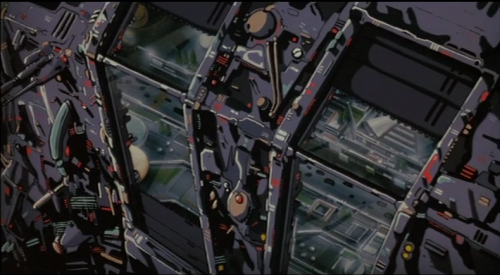 I’m almost positive for the creators of the original series details such as the exact location of Macross City within the SDF-1 was not a priority concern. 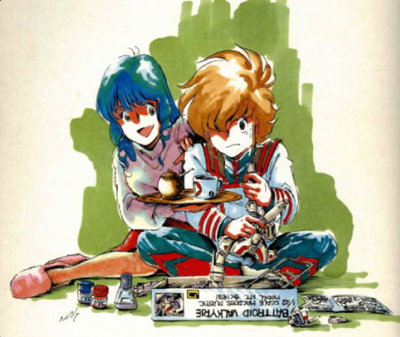 They could not have predicted that the series would be so popular that 30 years later people would be building the SDF-1 from LEGO and wondering where to place Macross City. Another point about the lack of information concerning the inside of the SDF-1, if the right leg contains the city then what is the left leg? Is it the barracks? Is it empty? Does it warehouse supplies and/or ammunition? Does it house Valkyries and Destorids? Yes, no? Also what is in the center section? What is in the other outer sections? 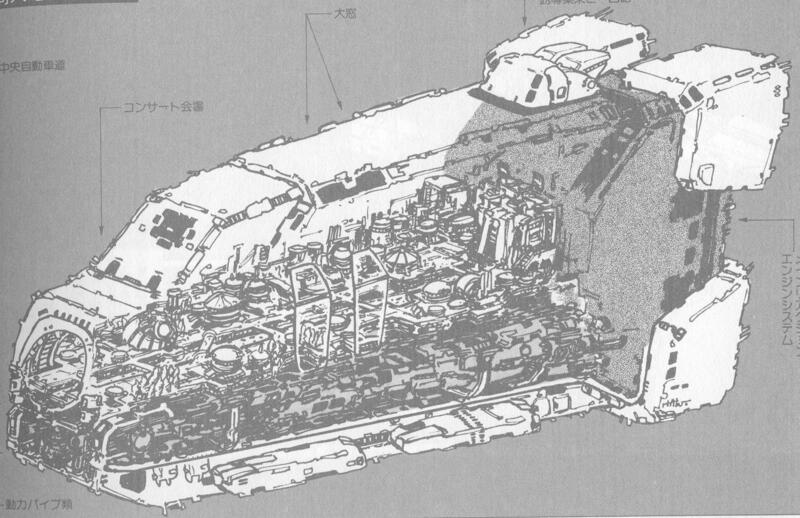 There is no map (or least I haven’t found one) that details how the inside of SDF-1 is layed out – for either the original Macross series or Macross: Do You Remember Love? 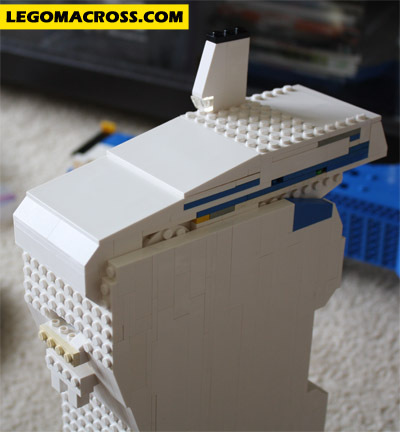 At this point I anticipate my LEGO SDF-1 to have three empty compartments: the legs and the main center section. I haven’t yet decided if I’ll follow the DYRL template and place Macross City inside the right leg. I also haven’t decided what to place in the other empty compartments, for example should I make it a space for a mini-barracks, should I create mini-Valkyries and store them there, etc.?. At this point I’m not too concerned about it because when I get to that point of the build it would mean I would have successfully accomplished building the legs and the second half of the ship and my LEGO SDF-1 would almost be finished!